I shall not bore you with photos of the same thing all at one go. I shall stop at two photos of this series. :-) I know not everyone is interested in 'old stuff'. This is the Oei Tiong Ham Building, at the National University of Singapore's Bukit Timah Campus. 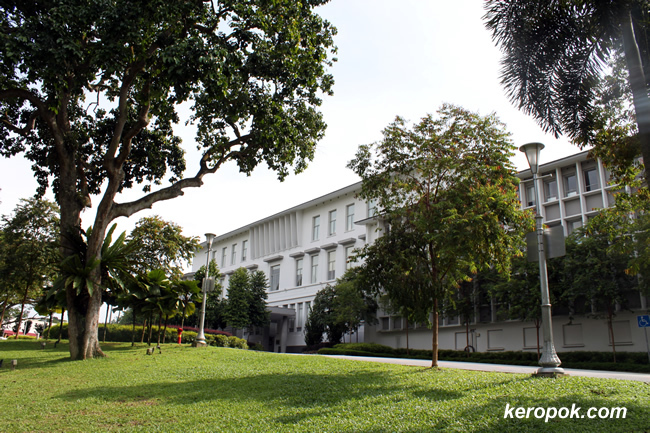 This building was named after the donor who donated $150,000 to the then Raffles College. So who is Oei Tiong Ham? The National Library Infopedia has a write up about him. It sure is interesting to read about him! I knew quite a bit abt the glorious days of the East Indies Company in dutch history. They brought the Golden Age (wealth)to the Netherlands in the 1800's. Far as I know, the spice trade were conducted with the Rajahs in each state. This piece abt Oei is interesting indeed. Good grief - how does one keep up with 8 wives ! "Oei !" we say in dutch to express "oops" or "oh dear" when something goes wrong. Might give u a tickle to know that eh ?